The online game of Rockstar is updated with the latest news. Rockstar has announced its batch of news and weekly updates to its video game GTA Online, the multiplayer version of Grand Theft Auto V. This week the virtual world of the title is updated with great rewards for the missions of contact. this week in GTA Online we invite you to stay with our old friends Lamar, Trevor, Martin, Gerald, Simeon, Lester and Ron to get the double GTA$ and RP on all missions contact (and murder) until the 12th November. 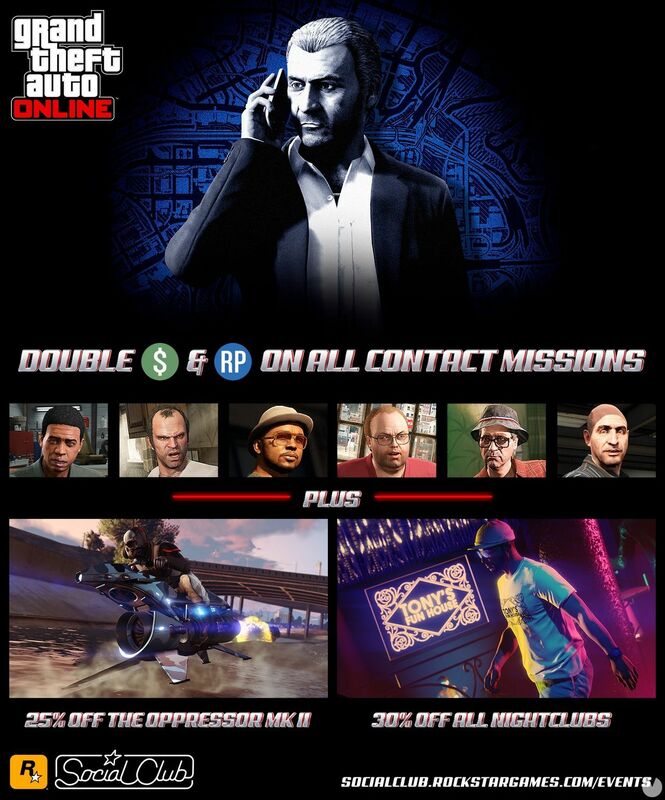 In addition, all jobs that start this week from the nerve center of Terrorbyte, also we will be granted rewards double, while the racing acrobatic Rockstar be awarded the double GTA$ and RP to all participants. Next to the business, it has been announced discount of between 25% and 30% in luxury vehicles selected, as well as in improvements of vehicles on low riders and low riders: Customs Classics.